When you go bareboating, hiring a kayak or SUP is a great addition to your trip. It allows you to get into the shallows where the boat can’t go. Explore the inlets and bays in silence, and get a little exercise while you’re at it. Bring your snorkel, mask and fins and use your kayak to explore the fringing reefs of the islands. 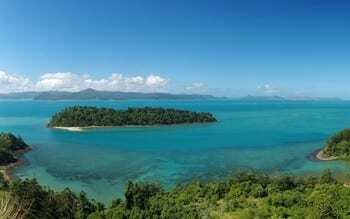 On the northern end of Whitehaven Beach is the sublime Hill Inlet. The swirling sands and bright white on aqua colour palette are famous around the world for their picture perfect pattern. Bareboats can’t safely go up the inlet, but a kayak can with ease. Navigate your way along the swirls of shallow water and find yourself a secluded beach. You might encounter little translucent fish, or even baby stingrays! Nara Inlet on Hook Island is a well protected anchorage that many bareboats overnight in. It’s a long narrow inlet about 4km long, lined with tall pine trees that looks a bit like a nordic fjord. You’d be forgiven for not realising you were in the Whitsundays. At the deepest point of the inlet is an Aboriginal cave, a short walk up from the waterline. While the resort is not open to day visitors at the moment, the island is predominantly national park and contains some challenging walks with spectacular views from the top. The walk from the resort jetty to Spion Kop is roughly 3km each way. There are many other walks that branch off from a main intersection in the middle of the island. Turtles are the most commonly seen sea creature, and you’re quite likely to hear a gasp of air and see a little turtle head popping up quite close to your kayak. Batfish are the most social fish in the Whitsunday islands and very accustomed to humans. They often come up right near your boat expecting to be fed. We don’t recommend feeding them as it disturbs the ecosystem, but that doesn’t prevent them from trying! Whales are a common sighting in the cooler months. Whitsunday whale season generally runs from June – September, when the whales migrate form Antarctic waters to the warm waters of Queensland to give birth. You may be treated to a sighting of a mother whale and a newborn whale calf if you are lucky.